It is shame for me :) that I did not find XFDF approach. Here is simple XFDF file, it demonstrate how it looks. 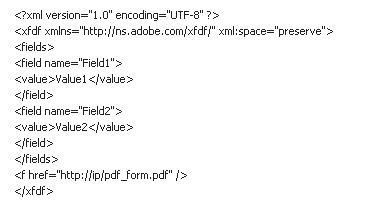 As you see it is really simple XML file and it will use http://ip/pdf_form.pdf file to show data from XFDF file. Now I am looking for 'opposite way'. Let's say I'm opened PDF file using XFDF approach and add some values to this PDF file. How I can get export this data back then to XFDF file? Does anybody have such experience? I spoke with my colleagues :-) they recommended to use FDF Toolkit For Windows, instead of iText approach that I used before, and I have to say that it is very cool approach, it is much better at least for me. Instead of generation new PDF file we just export data to FDF file and link it with PDF template and that's all, so our FDF will show data using PDF form/template. -> No Java required and now no non-supported libraries.
' the documentation for this application.
' This option oddly asks if you would like to save on close.
' This will create a random number between 0 and 100.
' attached to the Notes document and then deleted. sFdfFileName = sFilePath & fileName & ".fdf"
' FDF Toolkit Overview and Reference.
' Tell it which file we're writing to and do a save.
' Always close your open FDF files.
' and then delete it from the tmp directory. 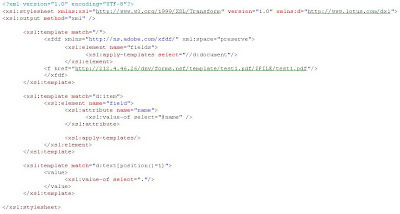 '// move each attachment to a rich text field.